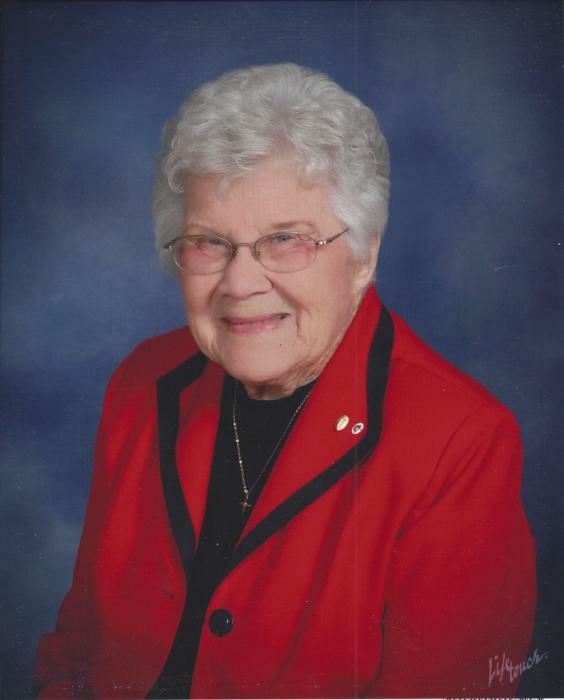 Anna Jean Wilson-Minor, a resident of Ashland Long Term Care was called to her heavenly home April 5, 2019. She was born in the family home at 434 West 8th, Ashland, Kansas at 10 PM May 2, 1924 to George Maben and Dulcie Fox Pike, the seventh of eight children. Mr. Pike was a photographer, owning Pike Studio, and public servant, having served Clark County as County Clerk and Probate Judge. Mrs. Pike was a homemaker. Anna Jean graduated from high school in May 1942, having gone all 12 years of schooling in Ashland, except for her sophomore year when she lived in Attica, Kansas with her sister, Mildred and husband Joe Urban. After high school graduation, she enrolled in the Colorado State College of Education, Greeley, Colorado, attending one quarter where she was the secretary to the Head of the Department of Languages. She then moved to Los Angeles, California, working for the Bullocks Wiltshire Department Store as a secretary, later transferring to the accounting department after taking a three-week night course in machine bookkeeping. She was later secretary to the production manager of Emsco where they made the landing gears for the Navy PBY planes. Anna Jean returned to Ashland late in 1943 and married G. T. (George Turner) Wilson on January 2, 1944. To this union two daughters were born, Georgeann and a year later Georgette who died before she was born. Anna Jean and G. T. were divorced in 1952. She worked for Stockgrowers Bank and Grimes Homegas, Inc.
Anna Jean and Georgeann moved to Hays in 1957 where she enrolled as a business major. She graduated in 1959 with honors having been elected to membership in Phi Kappa Phi. She taught 3 years in Jetmore, Kansas while also attending graduate school in Greeley, Colorado during the summers. She received her M. A. degree and was inducted in Delta Pi Epsilon. They moved to Pratt, Kansas where she taught 4 years at Pratt High, and 12 years at Pratt Community College. She returned to Ashland, Kansas to finish her teaching career retiring in 1989. Anna Jean loved to help people, so wherever there was a need, one would find her volunteering. She sang in church choirs 74 years, taught Sunday School classes 60 years, and worked at Hospice of the Prairie for 23 years. She married J. W. Minor September 5, 1992 and he predeceased her. She was also predeceased by her parents, 2 brothers (William and L. G.), 5 sisters (Virginia, Vivian, Mildred, Rose Helen, and Nita). She is survived by her daughter Georgeann, son-in-law Bill Lang, granddaughter Brooke (Nate Essington), great-granddaughter Meredith Ann Essington, 5 stepchildren, and their offspring. There's still time to send flowers to the Memorial Service at the Ashland United Methodist Church at 11:00 AM on May 2, 2019.